After the Goodbye Tour, listening to so many reminiscences, stories, and memories of wonderful practical jokes, several people suggested it would be a great idea to record them while they are still remembered. So here we go - a page that will be dedicated to such things. I can still remember many details of those marvellous two years. In early September 1952 we "poured" in through the main gates passing the dormitory huts on the right, in which we were to spend the first year. and a grassy paddock to the left. The six huts (not Nissan Huts) were joined by a long narrow corridor with wash rooms and toilets opposite each hut. At the far end of each hut were doors which opened onto an large area of grass and a few beautiful trees. At the far end of this area was the Rugby Pitch which now, sixty-five years later, is covered in new housing. The rugby pitch was home to a very good Shoreditch College team. We had a strong Welsh contingent. One outstanding result that I can remember is when we beat a Wasps Fifteen. Places in the six huts (A to F) were allocated alphabetically and so were the beds in each hut. Together with fifteen other students, I was placed in hut F. Most of us had just finished doing our National Service so this was a style of living that we knew well. Our hut was quickly named “Effingham”. There were many practical jokes played out during this first year. One of the funniest, we thought at the time, happened one warm summers night when a bed containing a soundly sleeping student was carried out onto the lawn where he slept for many hours. At the beginning of June 1953 there was a large celebration on Englefield Green to mark the Coronation Of Queen Elizabeth II. Many students from STC and Royal Holloway were there. Adjacent to the college grounds, the construction of the RAF Memorial was finished during 1953 and was opened by the Queen on the 17th October of that year. Many of us lined the lane to watch her arrival and departure. A few other things linger in my memory, like the camaraderie of the many evenings spent in the workshops while we strived to complete our "final jobs": the outings to Motspur Park for the inter- college Athletics Meetings and the "Smoking Concerts" which were written and acted by some very talented students. Mr Scrivens (Scriv) retired at same time as our year (52/54) finished their course. I have a clear memory of Scriv being carried down the drive astride the giant jack plane. It saddens me greatly now that Shoreditch Training College (for Handicraft Teachers) has gone and so by now will many of its students. 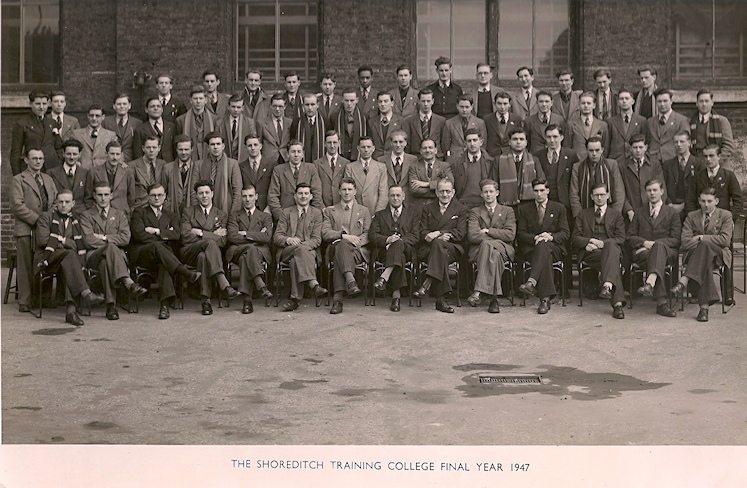 I have only recently (May 2012) come across the Shoreditch College Web Site and have since spent several evenings reading and re-reading its articles as well as viewing the various photographs. I must congratulate both of you on the effort it must have taken to put together such an interesting and enjoyable piece of work. The majority of the reminiscences refer to the period when the College was at Coopers Hill, so it was with great pleasure that I came across two contributors who must have been in College at Pitfield Street during the same period that I was there as a student. It would appear that Mr. Cyril Crawley was in his final year group when I was in my first year and Mr John Ackhurst was doing his first year whilst I was in my final year. Consequently their recollections are similar to my own. Shortly after the end of the war in Europe my application to enter Shoreditch resulted in being successfully interviewed by the then Principal Dr Bradley. My recollections after entering College are almost identical to those of my previously mentioned colleagues i.e. the bomb damaged areas surrounding the damaged College building; the difficulties in obtaining tools, materials and set books; the thrashing at Motspur Park & Peggy the Mascot Plane, named I recall, after the young lady who worked in the secretarial department. I also remember helping with building the stage once the main hall was back in use, for a Pantomime “Babes in the Woodwork” and an enjoyable production of Quintero’s “100 Years Old”. My overriding memory is of a very happy period of my life, despite the very difficult circumstances we were in, given the recent ending of WWII in Europe. I could go on, but appreciate the College has moved on a long way since those early and austere days. We had the good fortune of being tutored by knowledgeable and enthusiastic Lecturers led by College Principal Mr. A. G. Scrivens (Scriv) whose wisdom, energy and sympathetic nature overcame our rather dismal surroundings. Your web site re-kindled so many happy memories that I was prompted to search my own “archives” which produced the attached photograph of the 1947 Final Year, that I hope will be of interest. I also came across my rather worn College Badge which I have photographed and also attached. You will probably notice that many students in the photograph wear the badge. It was the only piece of identification available in 1945! If you think I can help fill in any other gaps around this time then please do not hesitate to let me know, but remember the memories all come from an ancient brain. PS Just in case you are wondering, I am in the attached photograph, third row back, thirteenth from the right hand side. I can recall a few names of others in the group. Mr Scrivens is naturally in the front row, seventh from the right hand side, with Mr Charles sitting to his left. A few pages from Malcolm Bidgood's entertaining autobiography, in PDF format. 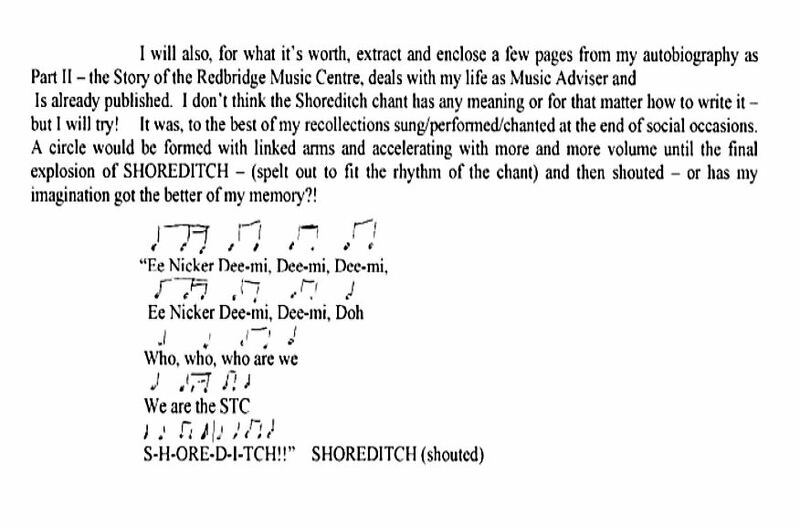 Also, the Shoreditch chant as best he could write it out! 1959-60 Supplementary year. The worries of pass/fail had gone and the extra year was one of great enjoyment giving the opportunity to experience various aspects of a wide range of creative activities not touched upon in the previous two years. Visits included Fairy Marine, Fords (I missed that one) the Airscerw and Jigwood Company, Thames Plywood and Swindon railway works. To see steam locomotives still being built was incredible. A piston chest had just been cast and was being de-sanded, sheets of 1inch copper measuring some 15ft square for lining fireboxes lying on the floor. The climax of the visit was to climb onto the footplate of a Castle Class recently ‘out shopped’ ie completely rebuilt. A delightful week was spent down in the New Forest at Lyndhurst courtesy of the Forestry Commission covering the whole gamut from seedling to mature trees and felling and marketing of timber. One’s social life flourished with the Tiddlewinks Club providing the opportunity to visit all the ladies colleges and arrange return matches, needless to say there was a large hidden agenda; well actually it was not hidden very well. Only in latter years one realises how fantastic a time it was to have studied at Shoreditch. It is sad to learn that it was soon to be absorbed by Brunel, closed down and sold. It appears now that there are few if any real craftsmen coming into the education system which the Government and James Dyson lament and are hoping to rectify this. Have just discovered this web site. I was a student in the 57 year and stayed for the supplementary year enjoying every moment except for teaching practice. On arrival John Mortimore and colleagues had the job of showing us to our hut and bed. Being a K I was in hut 3? with eight Welshmen, all who had done National Service but not me so I grew up pretty quick. In my second year I organised a trip to watch England play Russia at Wembley, our party included The Principal, Ted Marshall and Mr Williams, I like to think this helped me to get the third year. Charles Keeling and I shared a room in the 2nd and 3rd year and were fortunate to have the most right hand rooms on the first and second floor. Above our room in the attic was a transmitter for Pan Am and regulaly our radio would blast out pilots instructions. My claim to fame !!! was that I was secretary of the Shoreditch College Tiddlywinks team. Our initial match was against the Cambridge University team who had played the Duke of Edinburghs team which consisted of most of the Goon Show cast. Surprsingly all our subsequent matches were against the ladies colleges. My first teaching post was at Leatherhead. 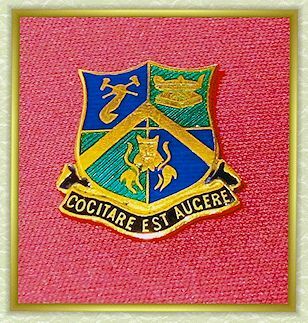 After two years I was most fortunate to be appointed to Truro School, a Methodist Public School. The workshop was in a terrible state so I set to and built 10 new benches in the summer holiday to show I meant business, they are still in use. From 1975 to 1977 we built new workshops, sports hall, two squash courts, working on Saturdays and evenings. We were told later we were the biggest self build project in the UK. We then capitalised on these spacious premises and built the Spirit of Truro which we exhibited at the Farnborough Airshow. Our expenditure in materials most years was over the £20,000 mark. I retired in1998 only then realising how lucky I had been. Thank you for setting up this web site, I wish you both a happy New Year and continued success. ... It is frightening to think that all of us [students] are retired. Whenever I am out I always hope I may meet someone from College but never seem to. One of our hut was Pat Lawson who was a prisoner in Changi, another Robert Hadfield had been a carpenter and would finish his six week project in a couple of weeks. My buddy Charles Keeling had the incredible skill of building ships in bottles. In our third year we fixed cast aluminium labels to the various trees in the grounds. I am saddened by the demise of skills in our schools especially when an exam board says it does not matter how it is made so long as the pupil has designed it ..... We had a reunion at school and one of my first O level pupils came up to me and demanded that I told every pupil that "this is the most important subject in the school". On enquiring about his career he told me that this subject had kept him sane as he was a Tax Inspector. Fascinating reading your website. I was very sad to hear the campus has been sold. I was a student here from 1990 to 1994 when it was part of Brunel University. Subjects on offer then were Industrial Design and Design and Technology teacher training. I was just wondering if your site could also contain more up to date history of the site. It was known to us as Runnymede or rather ‘Bunnymede’ in recognition of the large rabbit population. Although we were part of Brunel University we liked to consider ourselves separate from the Uxbridge Campus, that we called ‘Uxcrete’ in recognition of the large amount of concrete structures in place there! I lived in many of the halls of residences on the site for 4 years, including ‘President hall’ ‘Marshall Hall’, ‘Bradley Hall’ and for a brief time ‘Williams Hall’ and ‘Scrivens hall’ and never really appreciated that they were named after men that were connected with the site. Just wondering, has the demolition on site actually started as yet? I have just found the ‘Ditch’ site via my subscription of Furniture and Cabinet Making. Well done for keeping it going. There was the replacement of East Hampstead College bell; by which the place seemed to be kept in running order, with a budgie cage bell. When London Bridge was being dismantled and sold to the Americans a friend and a group of others ‘borrowed’ a number of stone balusters and held them to ransom. More trouble ensued. At the end of our first year about 120 of us were left in college after most others had left. Royal Holloway had gone ‘co-ed’ that year and the male students were in hall at the end of the lane past the RAF memorial. Somehow it was decided they would benefit from a bathing; this was at about midnight I seem to remember. As we approached en mass the security guys saw us and ran around inside locking windows and doors as we ran around the outside trying to find an open door or window. Eventually we ended up at the back and found an open narrow ‘French door’. I must have been about the 30th to go in and remember thinking how luxurious was the carpet I was standing on. At that moment a very refined and quite mature voice called out, ‘what the bloody hell is going on here’? All but one who had entered the room got back out through that narrow door in a split second. As we stood outside gathering our gorms someone said, ‘he’s got Andy’. At which about half our group rushed back in and rescued Andy by dousing his captor. It was only later we found out that the ‘captor’ was the Vice Dean of RHC who had been in bed with his wife. Very real trouble for us! But that apart it was a great place to have been trained. Does anyone remember Final Job night; the 1966 Rugby Club tour of Eastbourne, Bird Cage discos on Sunday nights, or the Third year who strapped his final job dining table on the roof rack of his car before driving under the arch; enough said! Thanks for your reply to my message. I've had my thinking cap on and come up with a few more names of students in my year. There was a Mr. Taffe, who was ex-service, a chap called Clinton Grassby and another John Willis, whose final 'job' was a rather fine carver chair. A couple of us were members of the University of London Air Squadron (U.L.A.S.) for a year or so. The summer camp was at an RAF station near Loughborough. I remember we had two flights in Dakota aircraft. One other student name has come to mind. Mr. Bateman was a mature student, under the auspices of the Christian Brothers if my memory is correct. For our course we did both wood & metalwork in the first year but were allowed to specialise for the second. I decided on Metalwork and later assisted an uncle to build a miniature steam locomotive. In addition we had to choose between Maths. Geography & Science. We also studied English P.E. (I have my 1933 Syllabus somewhere) Principles of Education and Art. During my one year's woodwork, (I did only metalwork in my second year) I made a stool, a small bookstand, a mirror frame and a cigarette box. The stool and the bookstand are still in use but I'm not sure what has become of the others. In metal there were a number of exercises in tinsmithing, soldering etc. I recall making a brass escutcheon plate and a shallow copper bowl. For the latter we had to learn the use of a planishing hammer. There were also a pair of toolmakers clamps, a scriber which had to have a hardened point, (heat in the furnace and watch for the straw colour) and a tool for a garden line. This latter required one to heat steel rod and forge it into shape. Riveting was also needed for part of this tool. My final job was to make a rebate plane. One of our theatrical productions was the "Nutcracker" for which we had to build a set featuring a room with a ceiling which could be lowered to crush the unfortunate lovers! The winter of 1946/7 broke all records. Heavy snowfalls followed by weeks of hard frost made life very unpleasant. As has been noted, conditions were far from returning to pre-war. Virtually everyone depended on coal fires for heat and coal was very hard to come by - stocks were frozen at the pit heads and there wasn’t the machinery or transport to move it. The College was closed down for three weeks, the one bright spot being that a number of us had become keen ice skaters and skating on the Serpentine was free. As we were now half way through the year “Scriv.” decided that a series of exams would keep us up to the mark. One of these was to be in Technical Drawing - unfortunately the room chosen for this exercise had suffered a leak - I am not sure whether from the roof in the thaw or a burst pipe - whatever the reason we stood in about an inch of water for a couple of hours. I can still see the expression on Ray’s face when time was called. He stood back for a moment to admire his work, unclipped it and then watched as it gracefully glided down to land in the muddy water. Fortunately the marking lecturers were very understanding. 1946 saw the revival of the London inter-College athletics at Motspur Park. To the dismay of certain lecturers the mass of students did not seem too interested in over exertion and there seemed to be a consensus that as we were not going to achieve much on the track and field we would make our mark in other ways. A coffin size model of a wooden jack plane was made, christened “Peggy”, and was to be our mascot. This was mounted proudly on the roof of the first of about half a dozen coaches which travelled in close convoy through the West-end of London carrying a bunch of very noisy students. Just imagine trying to do that today! On arrival “Peggy” was carried into the stadium by six pall bearers with due ceremony. This was probably appropriate as any hope we had athletic honours were duly buried that day. “Marjohns” swept the board, we came last, and from memory this was the result in succeeding years. Whatever happened to “Peggy”? I have already mentioned that many of the “mature” students did not suffer fools gladly and a number of them found it much more educational to attend the little “fleapit” cinema at the top of Pitfield Street on afternoons when the lecture did not seem to have much promise. This became so popular that in the end “Scriv.” felt he had to intervene. Believing in direct action he found the manager, asked him to stop the film and turn on the house lights - whereupon he jumped up on the stage and, identifying some of the more notorious characters by name told them to get back to the College - this they did, tails firmly between legs. Few people had cars so almost everyone travelled by train, mainly the Tube. One chap had a Morgan three-wheeler which, of course, inevitably ended up one day in the colonnade at the top of the steps in front of the main building . Car factories were working flat out producing the new post-war models but almost all were destined for export in an attempt to re-balance the national books. The few cars that were in private hands were nearly all pre-war. To buy a new one you had to put down a sizeable deposit, wait a year or two and then you might be lucky. By the standards of the day they were extremely expensive too. Only one lecturer seemed to be so lucky - and he had a brand new Jowett Javelin - still regarded as a good sporty saloon for its day. Naturally, when this first appeared it aroused the curiosity of the students who displayed a lot of interest in the novel sight. The owner was not so happy though at the many finger marks on his shiny paintwork - a point of view he expressed very forcefully. Ever co-operative the students made sure that the next day the car was liberally covered in “Do not touch” notices carefully pasted on. I think it was around the New Year 1948 that someone had the bright idea of re-introducing the “Inquisition” which we were told had been a feature of College life pre-war. This entailed a year group standing around in the chilly main Hall until called into the staff common room one by one. The sight that greeted us was of the full staff seated comfortably in a large circle around a roaring fire. One hardly had time to take in the scene when the hands of George Lucas descended on one’s shoulders and plonked you down firmly in a chair placed at the centre of the circle. Naturally it was “Scriv.” who presided and started the ball rolling with “ Mr. ……. - any comments gentlemen” - then looked meaningfully at each staff member in turn. Fortunately as we were called in alphabetical order and, I suppose, I came in that grey middle blur of ability my ordeal was soon over. Tough on those in the “Ts to Zs especially if they had been not too diligent. Was this ceremony repeated? - certainly it had disappeared by the time I went back for a supplementary year in 1958. By 1958 things had changed out of all recognition. Not only society but the whole country had largely re-established itself after the trauma of 1939/1945. The college, now in the beautiful surroundings of Coopers Hill had a feeling of order and permanence that we had not known in Pitfield Street. The spirit of the students had not changed though. There were two in particular who took it as a duty to amuse the rest and drive Ted Marshall, who by now was principal, to distraction. One of their more memorable efforts was to take advantage of the fact that it had been decided to replace the Victorian central heating system which meant that there was a temporary scrap yard of enormous pipes and boilers - and bear in mind that this was the era of awakening public interest in space travel. And so it was that everyone awoke one morning to find the College’s own space ship erected right in front of the main entrance and the principal’s office. How these huge and heavy metal cylinders had been moved and stacked up in the dark and without anyone seemingly being aware of what was going on has never been explained. We now have some photographs of the Spring Fair in 1963 and National Willy Bobs Week in 1962. The photos were provided by Quentin "Joe" Lyons, 1964 year and have been copied from the original slides, which is why the quality is a bit variable. Quite by chance I came across the Shoreditch Old Students Website and spent a happy half exploring it. The only disappointment was that there seemed to be little about the “Ditch” in the ‘40s. There was only one name that I recognised and that was of Colin Moscrop and his construction of the memorial lectern. I had the privilege of attending the third year course in 1958/9 and, looking back, I realise the conditions existing for students in those immediate post-war years would be unbelievable to the students of the ‘60s and later. If you will excuse the ramblings of an old buffer it may be of interest to record them. At 9 am. one morning in about the middle of September 1945 I left Old Street Tube station, crossed the fields of bomb rubble and presented myself to the Little Hall on Pitfield Street - the Great Hall was unsafe due to the shaking it had received by the bombing that had destroyed most of the houses in the adjoining streets. As a very immature and nervous ex- schoolboy I found myself in the company of about ninety strangers many of whom seemed to know each other. Looking around rather anxiously for a friendly face I noticed a chap sitting on one side who seemed quite unconcerned with situation and was engaged in drawing up some plans from the “Aeromodeller” magazine. Then, as now, many years later, model aircraft were my passion so I had found a friend. Ray Boxer and I still keep in touch. After a while a demi-god appeared at the front of the Hall, called out some names and marched off with the group. This happened a number of times until there were just about a dozen of us left. Time went on until we began to wonder if we had been forgotten when in walked someone I learnt later to respect as the great ”Scriv”. He coughed in a rather embarrassed way before explaining that although we had the educational qualifications to start the course we were too young as we had not reached the necessary 17 years. But we were not to worry as we were to be sent out on teaching practice. And so it was that just 6 weeks after leaving school I found myself standing in front of a class of rather tough boys at South Grove Senior school in Tottenham, right opposite a factory that manufactured a very pungent disinfectant. Fortunately the school was run by a martinet of a Headteacher by the appropriate name of Mr. Masters. The staff were all very friendly and sympathetic to my position. My hardest job seemed to be to keep a straight face to the remarks of my “tutor-teacher” who was a great loss to the music hall stage. Thus the time passed quite pleasantly. A month later back at the College a course had been hurriedly cobbled together for us consisting mainly of practical metal and woodwork - marvellous. However, it soon dawned on the powers that be that there existed a dozen or so eager beavers in the ”C” group that could be called on to do the many odd jobs around the place. By now it was November and Christmas was approaching so it was decided that the College had to start reviving the traditions that had been dropped during the war - the first of which was the Christmas pantomime. Suddenly the Great Hall was in bounds again - but it had no stage. Magically, from nowhere - though I suspect the LCC school stores, there appeared about a 100 old school tables. Ray and I were despatched to a building somewhere in Liverpool road to collect 28lb. bags of 4” nails. Thus was a stage built in about a week. Electrics were in the hands of Derek Burnand and Ernie Pyle (?) perched on a platform, spiked to the wall about 12 feet up - with no guard rail and no ‘elf and safety in those days. Apart from the time when one of them dropped a large screwdriver across the terminals of the main power feed blacking out the College and, I think, some of the surrounding streets all went well. The pantomime turned out to be a great success - we thought so anyway - we had a lot fun doing it and it certainly beat the school lessons we had been suffering just a few months earlier. After this other little jobs soon came our way. The army had been using the building during the war as a trade training centre and only moved out at the end of 1945 leaving their part of the building in something of a state. First we were recruited to make a long narrow room habitable as a cloakroom. This entailed hard graft with buckets of hot soapy to scrub years of grime off the walls. This was quite straightforward until one individual, who had best remain nameless, decided to settle an argument by demonstrating the correct way to execute a rugby drop kick by punting a large wet rag down the room - thus neatly taking out all 6 light fittings. It is difficult these days to imagine how basic life was. If anything wasn’t rationed it was in short supply. One of the lecturers, “Freddy” Giles, had obviously drawn the short straw because he had the unenviable task of trying to run a canteen for 90, and later, over 200 hungry students on virtually nothing. About the only things not rationed were vegetables. Rations were personal to the individual and no allowance was made for such things as College canteens. Freddy once told me that the Ministry of Food graciously allowed him to buy one penny worth of meat per student, per week - and that was an old penny worth less than half a new “p”. It is no wonder his hair was white! Supplies of materials were another problem. Those students opting to specialise in woodworking were expected to produce a major piece of cabinet making as a “final job” - something of order of a wardrobe or sideboard an item that would require about £20 - £30 worth of wood. Unfortunately an individual was only allowed to buy £1 worth per month without a special Ministry permit, something not allowed to students. The answer was to round up any one available, which usually meant the “C” group, pay their bus fares to Mallinsons at Old Ford where we would line up and each solemnly sign for our pounds worth. Our life was not all skiving though. As well as the workshop sessions we had book binding with “Jimmy” Lumley. A wonderful craftsman himself he expected us to be the same so that when he handed out the materials for latest exercise they would have been cut to within about 1/16” of the finished size and woe betide anyone whose work finished undersized. “Music Appreciation” with Alec Harwood was popular. He was a marvellous pianist and his sessions usually consisted of a conversation with the group on any and every topic, spiced with his own brand of very dry humour, while he continued to play. I owe him quite a debt of gratitude as it was he who first opened my eyes to classical music. September 1946 saw huge changes. From being a college with a roll of about 90 students in total the 1946 intake was 120. At the same time of course we found a lot of new faces amongst the staff. To begin with there were some tensions as some of the new students remembered some of the new staff as fellow students from the early war days. Those near the end of their course had been allowed to complete it whereas as the war went on manpower shortages meant that men were called up part way through and had to start again when they were demobbed. This soon settled down though as a mutual respect built up. The FET scheme, under which most of new students enrolled was probably one of the best things that had happened to education in many years. It brought into teaching many who had reached a wisdom and maturity much beyond their years. Men, some of whom had reached senior ranks and had faced the awesome responsibility of making decisions on which lives depended, did not suffer fools gladly. A striking example of this occurred one day in a lecture given to a whole year group in the Great Hall. The lecture seemed to be a lot of waffle with little obvious point, nevertheless we ex-schoolboys dutifully made copious notes giving the lecturer the unthinking respect that we had been expected to give our teachers. The end of the lecture came with the usual request for questions or comments. A long silence ensued when eventually a wise and much respected ex-service student looked up and, with the characteristic gesture of pushing his glasses up to the bridge of his nose, said -” Yes I think you are talking out of your a**e”. To us this was dynamite - and we waited for the explosion. None came. My apologies to anyone I may have forgotten after all these years. I have a few anecdotes which might be of interest. Our History Lecturer, Ted Joy, a man for whom I had a great respect and liking, once told us that history recorded that the first person ever to be killed by a motor vehicle was killed at the gateway entrance to STC. I can't remember the details, but it might be an interesting bit of history. One of the English lecturers, a Welshman by the name of, I think, Thomas, once told me that the golden years of STC were just after WW2 when all the students were ex servicemen - all keen to excel, all mature students and all keen to get out and earm money ASAP. He told me of one sports meeting when some students, who were ex RAF, hired a Tiger Moth and came over the venue and bombarded it from the air with flour bombs. I was privileged to spend 2 weeks on the Foudroyant; a great experience. I know nothing about the capstan. My understanding is that Foudroyant was/is built of teak - NOT the traditional oak. It was built in Trincomalee hartbour, (Ceylon - now Sri Lanka), hence the teak. I forget what its first name was but it was captured by Napoleon and re-named Foudroyant, which means 'Thundering'. When Napoleon was defeated we got it back and left the name unchanged. 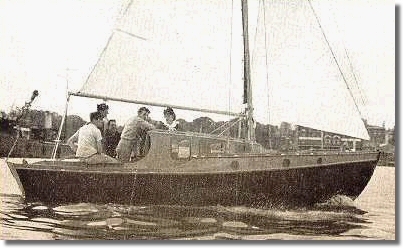 Your www suggests that it has been refurbished and is still afloat in, presumably, Gosport Harbour. The STC Principal who took a chance on admitting me to the hallowed halls of STC as a mature student without even the barest of academic qualifications, was Ted Marshall. He was the first to occupy that delightful new house by the college gates. He died in harness and, as the college was on Easter vacation at the time, and as I lived fairly close, I was asked to represent the student body at the funeral. My wife was heavily pregnant with twins at the time, (we arranged our pregnancies so that the births would hopefully occur during vacation times so that I could be at home and look after the other kids while worthy spouse was confined!). The day was 10 April 1964 - a date I remember well - a bright sunny spring day with hosts of golden daffodils everywhere, and, as the coffin was coming in one door of the church, the Bursar, Wilson?, was running down the aisle to find me to tell me that my wife had just been taken to hospital. So, as the coffin came in one door, I exited hastily through another. My twins were born a few hours later at Guildford. "Willy-bobs" took over as Principal. I had a great love and respect for him, and he did me some good services later on. I remember once when some students must have climbed the 2 towers on either side of the entrance and had strung a banner between the towers, proclaiming "NATIONAL WILLY-BOBS WEEK'. I never worked out how they managed to do it; they must have had mountaineering experience. Willy-bobs took it in good part. I was delighted to see the photos of the old place. We were the first students to inhabit the new halls of residence. I thought they were luxury. Three square meals a day - and all for free. I loved it. On looking out of my window one morning I found that the grass quadrangle was 'different'. I did a double-take and realised that there were large 'candle-cactusses' everywhere, and a few cows and other impedimenta. The boys had raided a film set during the night and had brought their loot back to college. A couple more anecdotes which might, or might not, be of interest. A couple of particular pals of mine at STC were Mike Curnow and Tim Gay. They were both mature students, having been intitially trained at Loughborough. They were under the tutelage of Mr Kettless, who had either been commissioned, or asked, to construct an altar rail for Egham Church (of England). Very fine plans were drawn-up and a supply of lovely English oak was obtained from somewhere. Mr Kettless persuaded Curnow and Gay to take this project on as their 'masterpiece'. They worked painstakingly and conscientiously at it for the whole year. It was a beautiful piece of work, which now, obviously, graces Egham Church. I used some of the same oak to make a chair on our 'chair-building-project'; the theory being that, 'if you can make a chair, you can make anything'. I still cherish that chair - the idea for which I got from the seats in the new Coventry Cathedral where my History tutor, Ted Joy, had taken us on one of the many 'Joy Rides' which he took us on. I have a number of photos which I took in and around STC. I also have a cutting from the Daily Telegraph, date unrecorded, of the aforementioned Tim Gay, now the Woodwork Master at Royal Russell School at Croydon, presenting to The Queen a hobby horse for the infant Prince Andrew. The hobby horse had been made by his pupils. I visited STC, (now Brunel), about ten years ago when on a visit to UK to introduce new wife to old rellies. It was during Summer Vacation. We were escorted around by one of the admin staff. I took her to 'The Eros Room' at the back of the main building facing north, on the right hand side. I was surprised that she did not know the name of the room, nor of its derivation. (I thought there might have been a plaque somewhere). I told her that it was called The Eros Room because. the statue of Eros, which stands in the middle of Piccadily Circus, was housed there during the war in an effort to preserve it from the Bombings of London. We went again to The Air Forces Memorial which is 'next door' to the college, overlooking Runnymede, where Magna Carta was signed. The names of some of my old pals are engraved on those walls - 'Airmen from World War 2, who have no known graves'. (Thousands of them). It is a beautiful place and visits there always bring tears to my eyes. It looks over the meadows of Runnymede, across Old Father Thames, and on to the north showing rural England as far as the eye can see - and, to the left, Windsor Castle not so far away. Surely one of the finest of vistas. I initiated a 'bit-of-a-rag' to greet new students in 1964. All new students were required to make, and bring with them, 2 boxes; one for their metalwork tools and the other for their woodwork tools. STC provided precise drawings which had to be adhered to. I posted a message that all new students were to assemble at a given place at a given time, together with their boxes, which would be assesssed. I enlisted the help of a few 'very mature looking' students from my own year to pose as the lecturers who would do the assessing. This took place while the 240 students from the previous years looked-on. So, there were 120 new students all with 2 boxes apiece all paraded just outside the dining room, with the rest of the college hanging out of upstairs windows. The inspection of boxes took place. The pretend lecturers did their marking and passed caustic comments on workmanship, then, at a given signal, the rest of the student body showered the whole proceedings with hoses etc.. I later heard that the assessment of incoming students' boxes was taken on board by the college as standard procedure! I feel priviliged to have been to "ditch". I can`t imagine any other college quite like it - with so many characters which come to mind - Sawdy, Chic Fowles, Stroppy Maynard, SAM and others. There is a saying that `great characters make great institutions`. And someone ought to write a book on all those ditch pranks (I nearly got suspended because of one!). Remember the time the college chapel was turfed up (including the lecturn) and the principal (Ted Marshall?) didn`t bat an eye lid and the Austen Seven that mysteriously appeared on the top of A block! My, those were the days.